Get whole-home mesh coverage with the TP-Link Deco M9 Plus AC2200 Smart Home Mesh Wi-Fi System. With advanced Deco mesh technology, the two Deco units work together to form one unified whole-home network with the same network name. Deco automatically chooses the best connection for your device as you move throughout your home. With support for Wi-Fi 5 (802.11ac) and three separate bands (5 GHz, 5 GHz, 2.4 GHz), the Deco mesh network can provide up to 1.5 Gb/s. A Deco 2-pack can cover up to 4,500 square feet, while a 3-pack or more boosts the range even farther. Deco M9 Plus acts as a hub for your wireless and smart-home devices. You can adjust settings and create interactions from one app. The Deco can also handle traffic for up to 100 devices. You can also use TP-Link HomeCare, which provides personalized security features, including parental controls, built-in antivirus, and Quality of Service (QoS). Setup is easy via the Deco app. 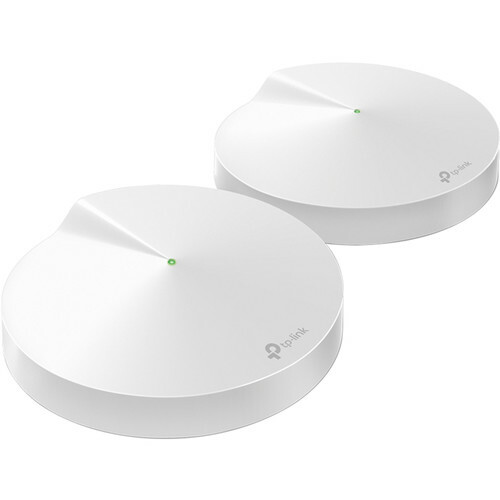 Three separate Wi-Fi bands deliver stable connections to devices in every room of your home. More bandwidth is freed up with dedicated wireless links between Deco units. Deco M9 Plus uses not only 5 GHz (867 Mb/s), as wireless backhaul, but also a second 5 GHz (867 Mb/s), and 2.4 GHz (400 Mb/s) as backhaul while traffic gets heavy, delivering speeds over 1000 Mb/s which is optimal for your gigabit fiber. Eliminate weak signal areas with whole-home Wi-Fi. No more searching around for a stable connection. Want more coverage? Simply add another Deco. Deco units work together to form one unified network. With network speeds three times faster than the previous generation routers, thanks to Wi-Fi 5 (802.11ac) wireless technology, Deco can provide lag-free connections for over 100 devices. Deco units work together to form one unified network. Enjoy your smart life without interruption not just in your living room, but all around your entire house with Deco M9 Plus's smart mesh. Deco M9 Plus acts as a smart home hub, bringing all your products together in one easy-to-use app. Set interactions between Zigbee, Bluetooth, and Wi-Fi devices. With Deco M9 Plus, enjoy the features of the smart home in every room. TP-Link HomeCare ensures every device on your network remains protected, with a threat database updated live by Trend Micro. Powerful parental controls can limit online time and block inappropriate content, according to unique profiles created for each family member. Built-in antivirus helps you defend against malicious website and guard your online payment. Box Dimensions (LxWxH) 19.4 x 12.4 x 9.4"
Deco M9 Plus AC2200 Smart Home Mesh Wi-Fi System (2-Pack, Refurbished) is rated 5.0 out of 5 by 1. Rated 5 out of 5 by Mike from Impressive technology I’ve worked in IT for a long time, and I’ve rarely seen a router of this easy to set up and configured. It took care of a dead spot in my house and the signal is strong everywhere. Highly recommend it.